In June 2017, the Managing Authorities of rural development programmes have submitted the first enhanced Annual Implementation Reports to the European Commission. In addition to monitoring information this enhanced AIR included for the first time the quantification of programme achievements through the assessment of the result indicators (including complementary result indicators), and answers to relevant evaluation questions. 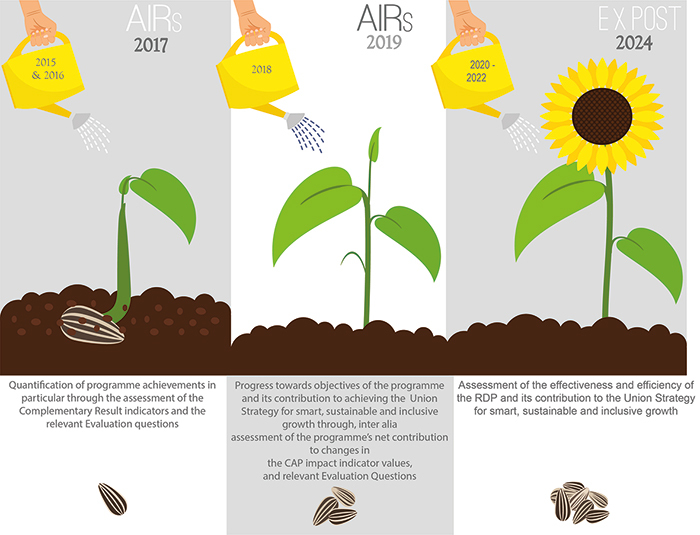 In 2019, the second enhanced AIR will build on this information further by providing the progress towards the programme objectives and on the achievements of the Union’s Strategy towards smart, sustainable and inclusive growth (Figure 1). This will be achieved through the assessment of programme net contributions to changes in the CAP impact indicator values, and answering the relevant evaluation questions. Against this background, the Evaluation Helpdesk in collaboration with selected experts and DG AGRI has launched its 5th Thematic Working Group in October 2017 and concluded it with the publication of the Guidelines: Assessing RDP Achievements and Impacts in 2019, which serves to provide support to evaluation stakeholders by providing a non-binding guidance document on how to structure their evaluation activites and answer the CEQs related to impacts for the AIRs to be submitted in 2019. Provide support for assessing the achievements of the EU level objectives and for reporting on findings in 2019. How to attribute changes observed in rural areas to the RDP’s effects? How to assess the RDP's contributions towards achieving the three CAP objectives? How to assess the RDP’s contributions towards achieving the EU 2020 Strategy for smart, sustainable and inclusive growth? How to ensure high quality data is obtained for a sound assessment of the RDP’s impacts? How to coordinate various data providers to get data suitable for the RDP evaluation? How to report on the assessment of RDPs’ achievements in the AIR in 2019? Download the Guidelines from the Evaluation Helpdesk's eLibrary!